For more than 10 years, there was a portion of the Independence Primary School parking area in front of the school that was home to a large recycle bin. Over the summer, the district had a concrete pad poured near the back of the building so the bin could be moved out of site, therefore opening up additional parking spaces. 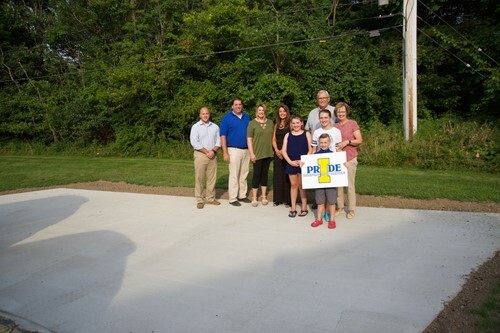 The concrete pad was donated by the Dalrymple Family, owners of North Coast Construction. Brian Dalrymple is vice president of the company and a parent to a second grader, Cameron and a fifth grader, Lauren. His wife, Erin, is a recess aide at the school. The district thanked the Dalrymple family for their donation at the school’s open house on August 20. Grandparents of Cameron and Lauren, Robert (president) and Linda (officer) of North Coast Construction also were present. “We are extremely appreciative of this incredible donation to our school from one of our own primary school families,” said Principal Cynthia Ipsaro, Independence Primary School.